Today I’m celebrating 6 years of alcohol-free living. 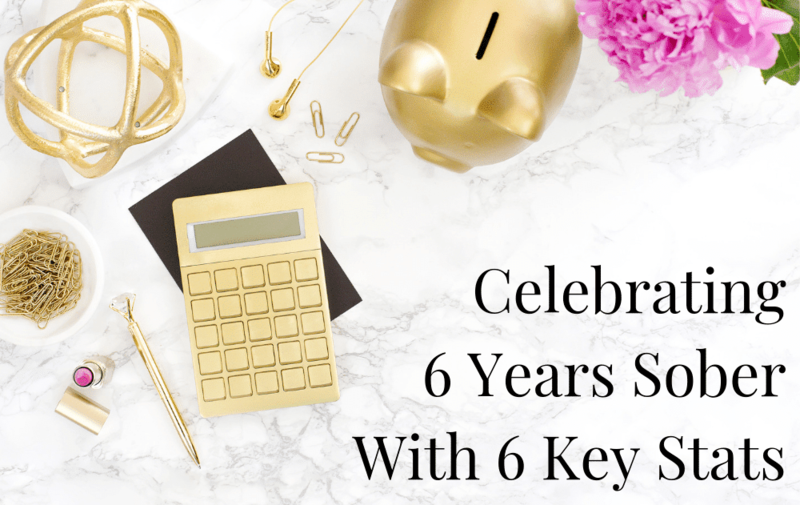 Six YEARS! I’m so pleased that back in April 2013 – for some unknown reason – I finally decided to pay attention to the voice in my head that had been wondering whether I’d be happier sober. Initially, my plan was to stop for 100 days as an experiment. I promised myself I’d give it my all and see how I felt afterwards. 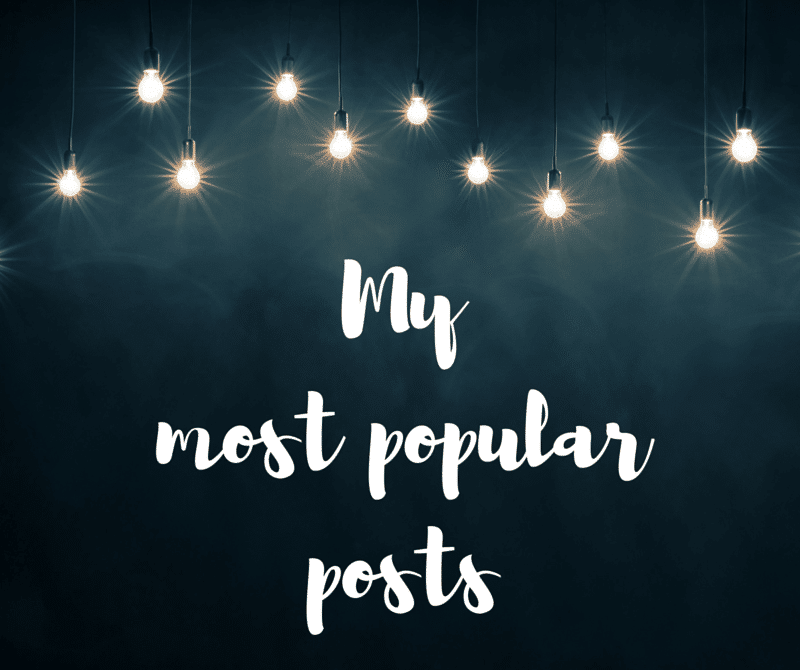 It’s hard to measure the impact sobriety has had on my life over the past 6 years, but in this blog I’m trying really hard to do just that! 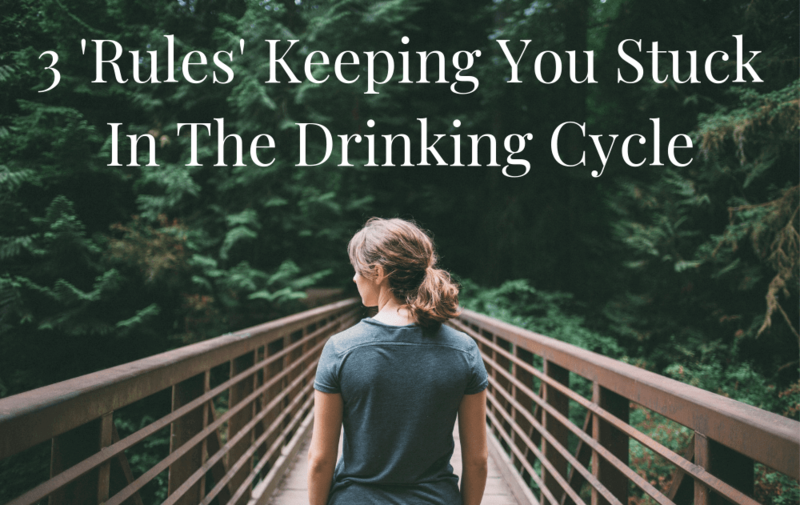 The hardest part of writing this blog was working out how much I actually used to drink, because it varied so much! Sometimes I’d be good for a few days and then drink two bottles of wine a night. Other weeks I’d have a few glasses after work, night after night after night. Sometimes I didn’t drink wine – I switched to gin and tonics. Or strong cocktails. So calculating some kind of average is tricky. But having read back through some old diaries, I decided – for simplicity – to account for 2 large glasses of wine a night (250mls of wine per glass). But as I said, it was often more than that. 730 glasses a year = 243 bottles a year. 243 x 6 years = 1458 bottles! Pretty amazing, huh? That’s £1458 a year. And the thing is – I know that figure is wrong. It’s a massive underestimate. To calculate this I stuck with the formula I used above, i.e. 2 glasses of wine a night. A bottle of supermarket wine costs around £6. But obviously, wine purchased in a restaurant or bar costs waaaaay more than that. Things like cocktails, prosecco and spirits are all very pricey too. I haven’t even attempted to work out how much money I spent on taxis home, late night takeaways, and the cost of replacing missing keys / phones / train tickets etc, all of which I was very good at losing! Wow. That’s not far off a million calories! One glass of wine contains 210 calories. So two glasses of wine a night means 153,300 calories a year. Now of course, it’s not as if I only drink water these days. I enjoy lovely alcohol-free cocktails, and the occasional AF beer. Obviously those drinks contain calories too. However, the liquid calories I consume nowadays are nowhere near what they once were. And alcohol-free drinks never, ever make me crave stodgy, calorific snacks in the way that booze always did! This was another tricky one to calculate, because sometimes I’d be able to power through my hangover – I’d go to work and get the job done, even though I didn’t feel great. On other days, I lost hours and hours. I wasted so much time being drunk, hanging out with people I didn’t like that much, getting into stupid arguments and watching movies I wouldn’t even remember afterwards. And I can think of plenty of weekends where I had to cancel plans because I was too hungover. I don’t think it’s unreasonable to allow 1 hour a day for all that drinking and recovering afterwards. That’s 2190 hours saved over the past 6 years i.e. 91 days. Heck, even if you halved that figure to just 30 mins a day, we’re still talking about weeks and weeks of my life! Even a few glasses affected the quality of my sleep. I’d wake up at 4am, tired but somehow wide awake. I’d often toss and turn until 6am, before finally going back to sleep just minutes before my alarm went off. That was very annoying! When I was drinking I was more inclined to stay up late too – even if I was just home alone, watching trash TV. When you account for going to bed late, and then losing a few hours around 4am, you very quickly end up in a big sleep deficit. I’d say I easily lost 8 hours – one night’s sleep – a week. Multiply that over six years and you’re looking at 312 nights. That’s not far off a year! Ah, I’d love to be able to put an actual figure on this! When it comes to sobriety, there’s a lot of important stuff you can’t actually calculate: e.g. memories and opportunities gained, increased self confidence, self worth and overall awesomeness. You simply can’t measure that stuff. As a drinker, I regularly blacked out, which means there are pockets of time I do not remember. There are other times that I kind of remember, but not with much clarity. And that’s such a shame because I’m talking about weddings, holidays, parties and special moments that should’ve been very memorable. Nowadays, I love knowing that I’m showing up fully for my one and only life. It’s not slipping by, blurry and forgotten. We only have one shot at this thing called life… so why not be fully present for it? That’s the kind of reaction I used to get whenever I spoke to my friends about my drinking. And to be honest, it’s the kind of thing I often said myself. When I thought about problem drinking, I used to think in stereotypes and extremes, often picturing down-and-outs, who drank all day and had lost it all. My life was a million miles from that. So I was fine… right? What I didn’t realise at the time is that there’s a pretty big grey zone in between ‘normal drinking’ (whatever that actually is) and full blown, pouring-vodka-on-your-cornflakes type of drinking. And guess what? A lot of harm and unhappiness can happen in the grey zone. If your drinking is worrying you, but you’re not sure whether things are ‘bad enough’ yet, this blog is for you. 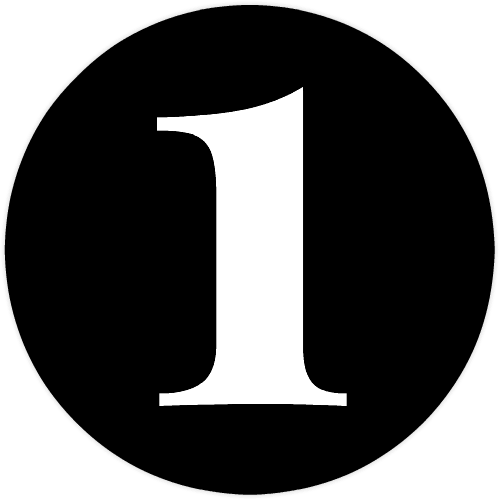 1 – You spend a lot of time thinking about drinking – what, where, when, how much. 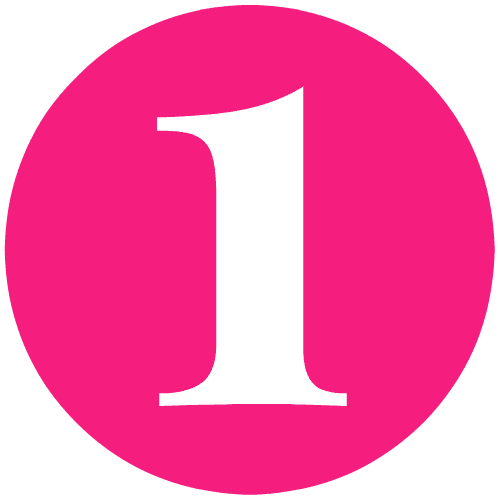 2 – You often promise to ‘just have one’, but that rarely happens. Once you start, it’s hard to stop. 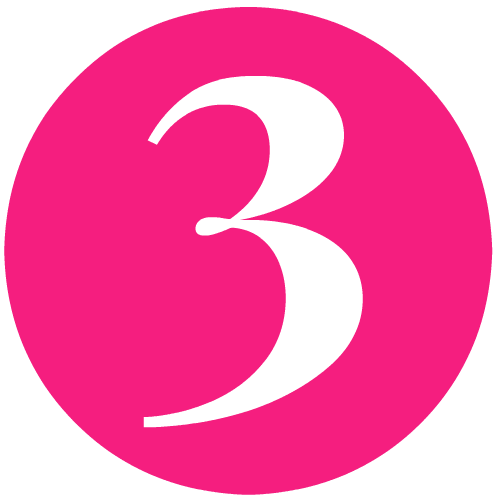 3 – You’ve created lots of rules around alcohol e.g. not drinking before a set time, only allowing yourself certain types of drinks. 4 – You frequently break your own rules. 5 – You’re ashamed of your drinking and beat yourself up about it. 6 – You try to hide how much you’re drinking from those closest to you. 7 – Your partner has expressed concern. 8 – Your drinking feels like a big, heavy secret – it’s a source of stress and anxiety. 9 – You dread putting out the recycling bin. Sometimes you dispose of empties away from your home so no one else notices. 10 – Given the choice, your favourite way to drink is by yourself. Alone, you can have as much as you like without being judged. 11 – When socialising, you keep a careful eye on everyone else’s glasses to make sure you don’t drink too fast. 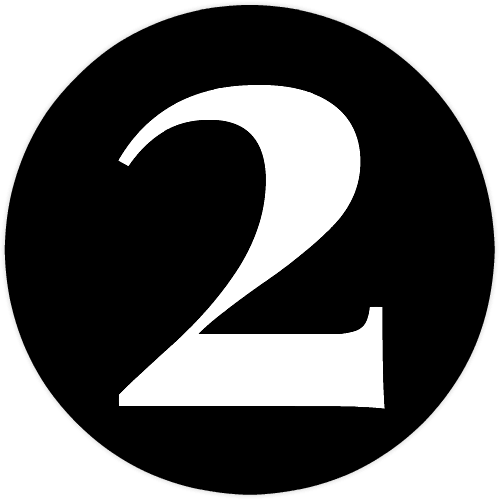 12 – In public, you work hard to be moderate. People would be surprised to discover quite how much you drink at home. 13 – You’re passionate about running or yoga, so everyone assumes you must be super healthy. This makes you feel like a fraud. 14 – You’re disappointed – angry, even – if you’re unexpectedly asked to be the designated driver. 15 – When someone makes a joke about your drinking, you’ll analyse it for hours, wondering why they said it and what they really know. 16 – You’re often anxious about whether there’s enough alcohol available. Will your supplies last? Should you get more? 17 – You buy your wine from different shops on rotation because you’re worried the store staff will judge you. 18 – You’ll often delay eating so you can drink without a full stomach dampening your ‘buzz’. 19 – You feel bad about rushing through things, such as your child’s bedtime story, in order to be able to drink. 20 – You’re regularly blacking out. There are long periods of time that you have no memory of. 21 – Mornings often begin with you trying to work out who you called last night and what you posted on Facebook. 22 – You frequently argue with your partner whilst drunk and then cannot remember why the next day. 23 – You drink to manage your emotions. It’s your go to whenever you’re stressed or sad or tense. You have few other coping mechanisms. 24 – After a change in circumstances, e.g. retirement or leaving a stressful job, you thought your drinking would naturally wind down, but it hasn’t. 25 – You’re permanently exhausted. Alcohol is seriously affecting the quality of your sleep. 26 – You rarely have enough energy for the hobbies you used to love. 27 – Your physical appearance is changing. Your face looks puffier. 28 – You diet hard during the day, but you’re still putting on weight – you know the empty booze calories aren’t helping. 29 – You’re scared something bad is going to happen. You’re not sure what, but you’ve had a few close shaves recently, e.g. driving when you shouldn’t. 31 – You find yourself on websites like this. Ultimately, if your drinking feels like it’s becoming a problem, then it probably is. You don’t need to wait for things to get worse. You don’t have to hit rock bottom in order to change – you can raise your standards any time you like. 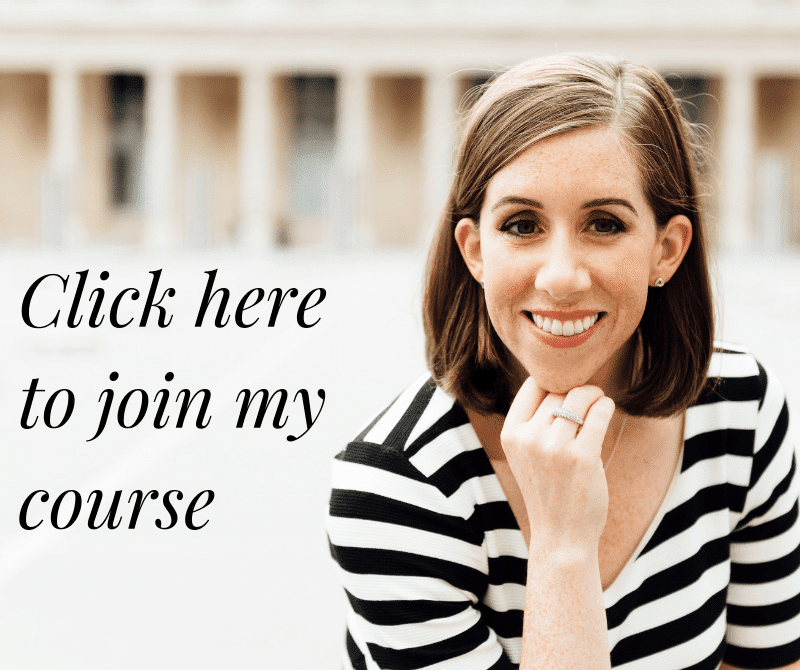 If you need support to quit drinking or take a break from booze, you can find out more about my online course here. 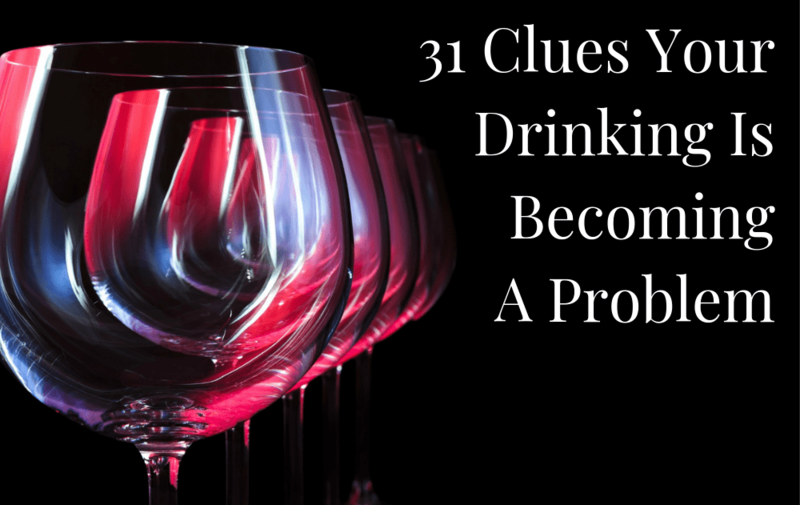 How many of these 31 clues resonate with you? And if you’ve already quit – how did you know it was time to stop? What prompted you to take action? Back when I was drinking too much, but I didn’t know what to do about it, I tried hard to ‘be good’ from Monday to Thursday. I could get my head around staying alcohol-free during the working week. But a sober Friday, Saturday and Sunday? That was not going to happen! Because I wasn’t ready to quit completely, being good during the week seemed like the next best thing. What I didn’t realise is that there’s a big problem with ‘Monday to Thursday sobriety’. If you’re only ever sober during the working week, what you’re really telling yourself is that alcohol-free living is only ever possible when you’re at work, in a routine and not doing anything fun. Basically – you’re treating sobriety like a strict diet. Not only are you teaching yourself to believe that you can’t stop properly, you’re also reinforcing the idea that sobriety = hard and boring, whereas drinking = joy. Long term, successful sobriety happens when you realise that you can live a full and happy life without alcohol, no matter what day of the week it is. When you’re only ever stopping for a few days, all you can really do is cross your fingers and hope for the best. You’re not giving yourself enough time to get clear on why you’ve been drinking, tackle the root causes or find some sober tools (i.e. alternative coping mechanisms). To be happily alcohol-free, you’ll also want to work on your mindset, tackle your limiting beliefs and educate yourself about alcohol. Doing all that stuff takes a little while, and you deserve the time and space to make a proper go of it. You never, ever get to the good bit! 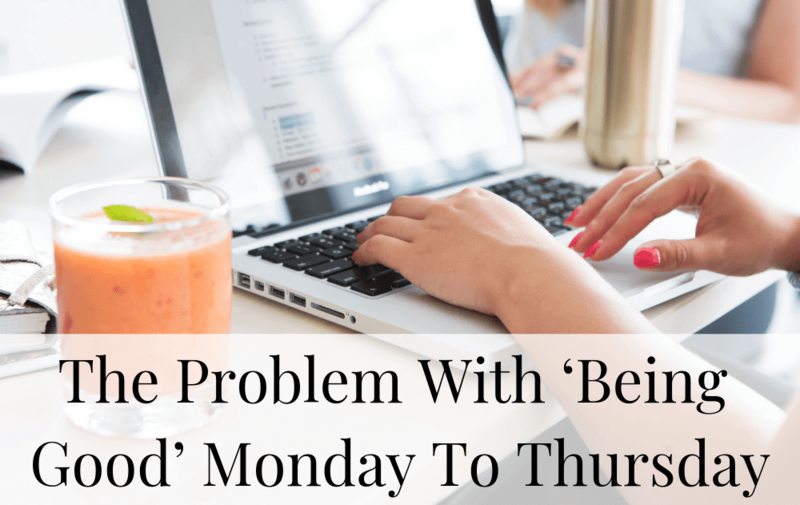 If you’re only quitting from Monday to Thursday, here’s what you’ve got to know: you’re forcing yourself to repeat the hardest bit of sobriety again and again and again. Seriously – the early days are some of the hardest! So why keep putting yourself through it? It takes time to find your sober feet, overcome a few challenges, smash some sober firsts and gain a bit of momentum. Studies show that you need 66 days for a new habit to bed in – so it’s hardly surprising that taking four days off here and there isn’t enough. You don’t need to quit forever (that’s way too intimidating). But you do need to be able to experience sobriety properly and see what it’s REALLY like. And that means taking a break from drinking for two or three months. That’s when you start to see what it’s really all about. Taking alcohol off the table for a defined period of time means you can give sobriety 100% and throw yourself into it, whilst feeling safe in the knowledge that at a set point in time, you will stop, review and decide what happens next. What’ve you got to lose? If you need support to stop drinking or take a break from booze, click here for details of my online course. Download your free Wine O'Clock Survival Guide! Your free guide is on its way - please check your email! This is something I used to ask myself a lot. In other areas of my life I was proactive and determined; I was great at problem solving and finding solutions. So when it came to sobriety, why was I so stuck? If you’ve been asking yourself the same question, this blog is for you. In many areas of life, long term goal setting makes sense, because most of us like to know what we’re working towards before we begin. But when it comes to sobriety, this approach can lead to so much overwhelm you never even get started. Your mind races years into the future and suddenly, you’re worrying about things that haven’t even happened yet. The thought of being sober forever is so intimidating you can’t bring yourself to get started. The trick is to move forward with a short term plan – one that gives you something to work towards, and lets you experience alcohol free living properly, without being so intimidating it feels unachievable. Taking a break for two or three months is a perfect place to start, because it gives you the chance to overcome a few challenges and test drive sobriety properly, without you getting too freaked out about it. Once your break is over, you can see how you feel at the end. Perhaps you’ll set another short term goal. Or maybe you’ll go back to drinking. Whatever the outcome, you’re in control and moving forward, step by (manageable) step. To get ahead in school, you had to pass your exams. To get promoted at work, you have to hit your targets. In most areas of our lives, we’re conditioned to think that success = good, and failure = bad. So it makes perfect sense that we’re not keen on trying something that exposes us to a massive risk of failure. When we’re so fearful of failing, putting up with the status quo can feel much safer (even if it is making us unhappy). The key is to reframe your relationship to failure. This doesn’t mean setting out with the express intention of drinking as soon as things get challenging, but it does mean not beating yourself up if something goes wrong. When I think about my students, most of them have a string of ‘failures’ behind them. Perhaps they joined my course after struggling to quit alone. Maybe they ‘wasted’ a month going to AA meetings and getting nowhere. But those ‘failures’ weren’t really failures – they were part of the journey. 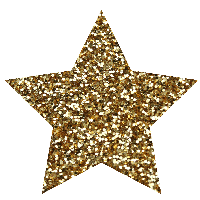 When you’re doing something great (and sobriety is great!) the chances are you won’t figure it all out the first time. You are going to fall flat on your face at some point. The important thing is that you get back up again. No one else can run the race, take the exam or ace that job interview for you. I bet you’re used to relying on yourself and you’re proud of the fact that you can (usually) figure things out on your own. Your drinking is your business… right? The thing is, your drinking isn’t just about you. It impacts every area of your life, from your health to your relationships. When you’re struggling with alcohol, your partner knows about it. Your kids pick up on it. Your friends notice something is off. Start looking at how you handle other challenges e.g. 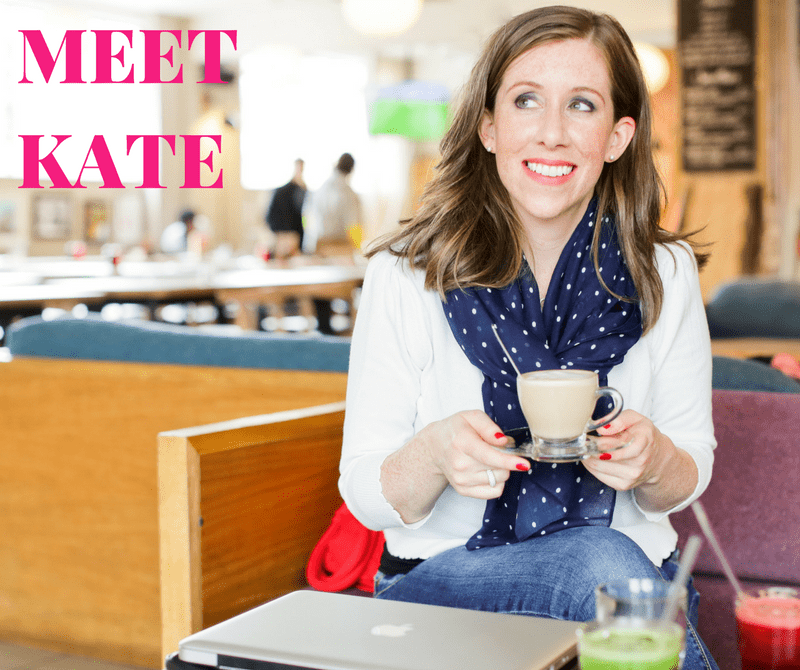 losing weight, training for a run, parenthood, learning new job skills… you get the idea. How often do you truly go it alone? Or do you look elsewhere for help, guidance and support? If you’ve been struggling to figure this all out on your own, now is the time to get out of your own head and start thinking about where you can get some support. We all need a bit of accountability and an outside perspective at times. 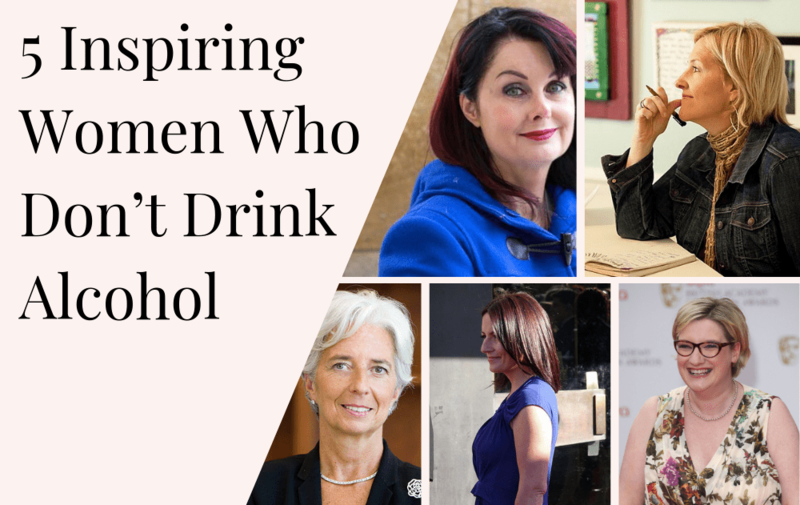 International Women’s Day is just around the corner – so I wanted to celebrate the achievements of inspiring women who don’t drink alcohol. I’ve written before about sober celebrities, because it’s amazing just how many stars have quit booze. But my blog today isn’t your typical run down of famous faces who don’t drink alcohol. 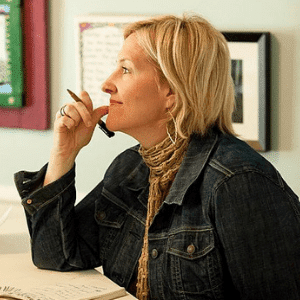 Brene Brown was an obscure academic – an associate professor of social work at the University of Houston – until her TED talk on vulnerability went viral. Nowadays, she’s an Oprah approved author with a string of best-selling books. Millions of people have been changed by her research into courage, vulnerability, shame and empathy. If you’re a woman – and a drinker – then I strongly recommend you check out her books. Brene Brown quit drinking and smoking 20 years ago and I’m sure if she hadn’t done so, her important research may never have come to light. 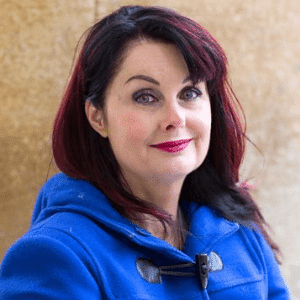 I discovered Marian Keyes’ novels sometime during the late 90s and instantly loved them. Her books are often dismissively referred to as ‘chick lit’, but they tackle some pretty dark subjects. If you haven’t read Rachel’s Holiday (about a cocaine and alcohol addict drying out) then you must. The best-selling author has been open about her other struggles too, particularly her battle with depression, which hit her in 2009 and lasted for three years. She later wrote a memoir about how baking helped her through her illness. 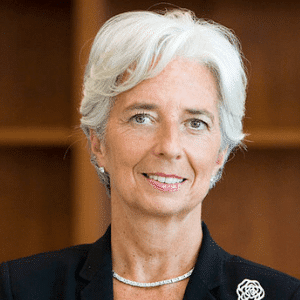 Christine Lagarde is the managing director of the International Monetary Fund. She is the first woman to head the IMF and was ranked the 3rd most powerful woman in the world by Forbes magazine last year. As well as being teetotal, Lagarde is also a vegetarian – both are traits which are practically a sin in her home country, France! These days, the 50 year old is the poster girl for healthy living, but the TV presenter and fitness fanatic was addicted to drugs in her twenties, after a tough childhood with an alcoholic mother who abandoned her. I think I fell in love with Davina McCall during her gruelling 500 mile Sport Relief triathlon a few years ago, when she showed incredible strength and resilience. She’s refreshingly unapologetic about her commitment to fitness and wellbeing. And yet somehow, she makes you feel as if you can do it too. 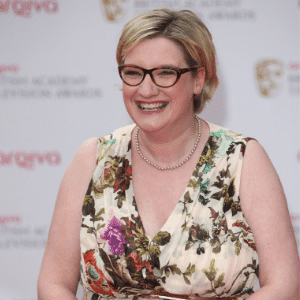 Sarah Millican was 29 and working in a job centre when her first marriage ended. She turned her divorce into stand up – and struck comedy gold. What do I like about Sarah Millican? Well, she’s unashamedly herself: an exercise-shy, pen-collecting, cake-lover who doesn’t drink because “the after effects weren’t worth the fun times”. Fed up with the state of women’s magazines, she launched her own one with “no photoshopping, no calorie counting, no cellulite circling.” After critics mocked her for wearing a flowery dress on the red carpet, she deliberately wore it again, to make the point that she should be judged on her comedy, not her clothes.